Rare Breed was first released in 1991. Since then, there have been over 10 batches released. The batches were once denoted by a batch number, but more recently only by a unique proof. 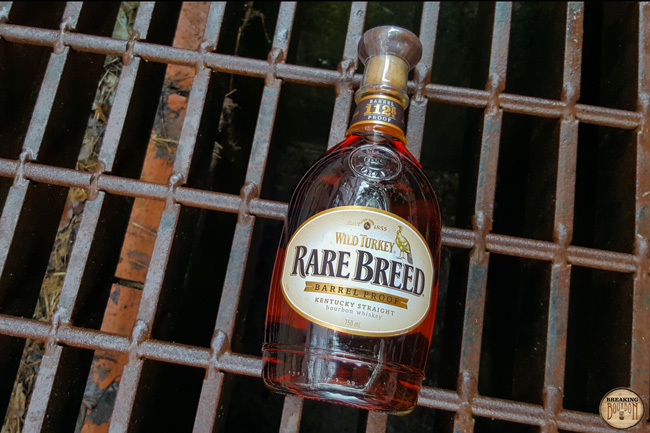 Rare Breed is a blend of 6, 8, and 12 year old bourbons, and though this blend of ages is not detailed on the label, it has been confirmed by Wild Turkey Brand Ambassador Matt Gandolfo in a Bourbon Pursuit podcast. Wild Turkey uses a single mashbill for all of their bourbons and bottles Rare Breed at barrel proof. Wild Turkey’s barrel entry proof (the proof the distillate enters the barrel for aging) is relatively low at 107 to 115, up from 105 at one time, resulting in a low bottling proof by comparison to competitors’ barrel proof products. Since its first release in 1991, the Rare Breed label design has changed three times, with a fourth label change registered on the TTB website. While the TTB label suggests the next batch will be 116.8 proof, this is subject to change. Bold and spicy. Subtle hints of raw grains mingle with peppery seasoned wood. Rye spice is most prominent along with a healthy dose of alcohol that tingles my nostrils. It has a big, spicy pop upfront. 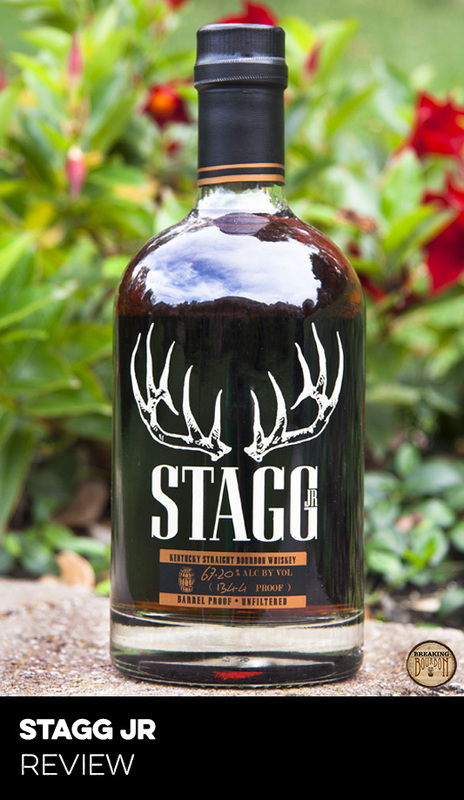 Bold rye, pepper, and a small amount of seasoned oak give way to a developing sweetness. From nose to palate it has a fairly singular focus on spicy elements. 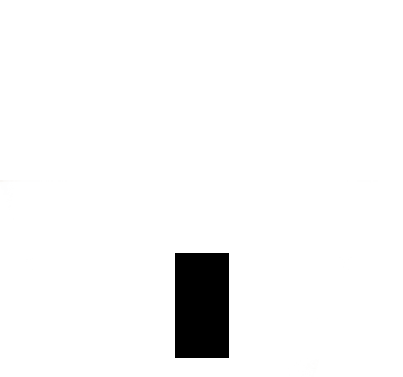 While not bad, it’s rather one-dimensional up to this point. Spicy rye and seasoned oak carry over into the finish, however sweet cane sugar, light caramelized wood, and vanilla take over as the spice dissipates. The sweetness lingers for some time with only subtle hints of rye spice remaining in the background. It’s an enjoyable finish you can chew on and without question the highlight of each sip. Rare Breed was first released in 1991 and along with Bookers, remains one of the longest running barrel proof bourbons on the market. 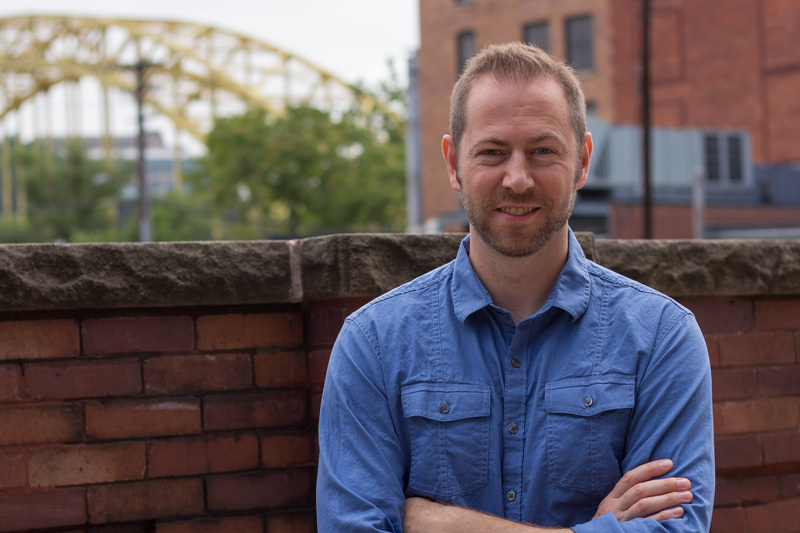 Anecdotally speaking, I feel Rare Breed is not given as much attention as it deserves. 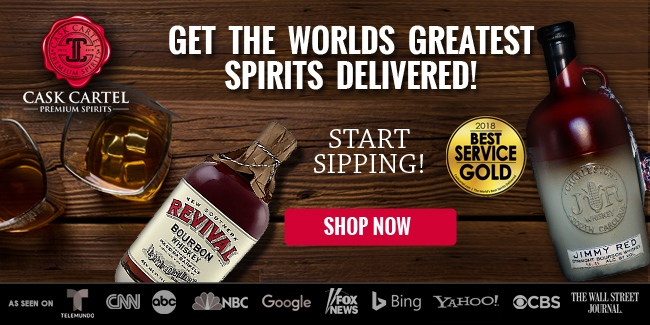 This is possibly due to its proof being on the lower end of the spectrum for a barrel proof bourbon, along with other Wild Turkey brands that may cannibalize its own consumer base to some extent. 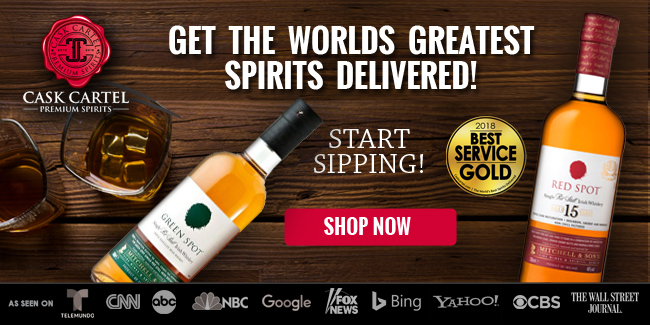 Ironically, the company’s flagship Wild Turkey 101 is considered high proof with respect to its competition at the price point. It’s said to be around 6-8 years old and only about 11 proof points lower than this batch of Rare Breed. 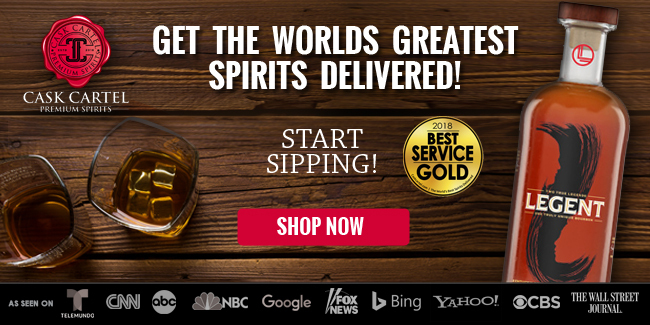 The company also bottles Russell’s Reserve Single Barrel under their Russell’s Reserve line, a nearly identically proofed premium single barrel bourbon that’s typically around 8-10 years old. There are other Wild Turkey products in this age/proof range, but the point is I enjoy both of these products more than the current batch of Rare Breed and they provide boundaries for me with respect to the Wild Turkey family of bourbons. 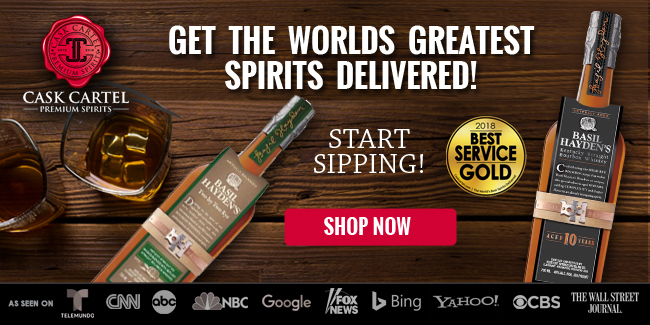 Wild Turkey 101 is a more flexible option at a slightly lower price point and Russell’s Reserve Single Barrel is a more premium option at a slightly higher price point. They both offer characteristic “Wild Turkey” flavor profiles and they’re both really good, so much so we included each of them on our “Best Of” bourbon lists within their respective price ranges. As a result it’s not immediately apparent why I would buy Rare Breed when both of these options are available. 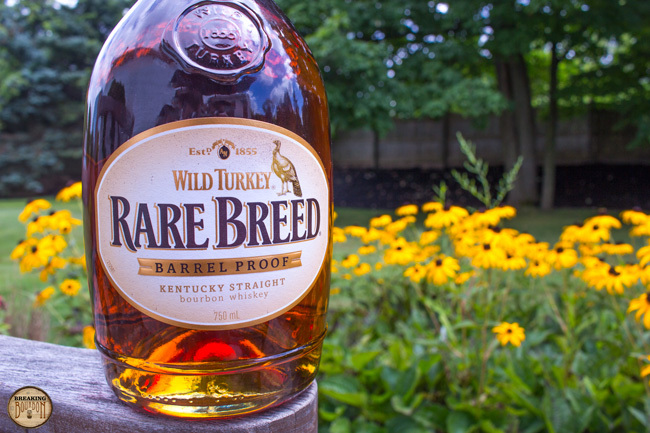 It’s only after further tasting that I’ve come to better appreciate some of the nuances of the Rare Breed brand and what it has to offer within Wild Turkey’s lineup. Since Rare Breed is batched and each batch can be identified by batch number or proof, I took the opportunity to compare this to the only other batch I had on hand, a sample of the very first batch released in 1991 which we received courtesy of Josh from Red, White & Bourbon. Batch 1 is a standout, by comparison with the 112.8 proof batch in review, but also by comparison with other bourbons in general. I can fully appreciate why Josh describes it as “...one of the best bourbons ever bottled.” In my own comparison, I found Batch 1 to have a more complex and inviting nose, more depth and complexity in the palate, and an oakier, drier, and more mellow finish than the 112.8 proof batch. 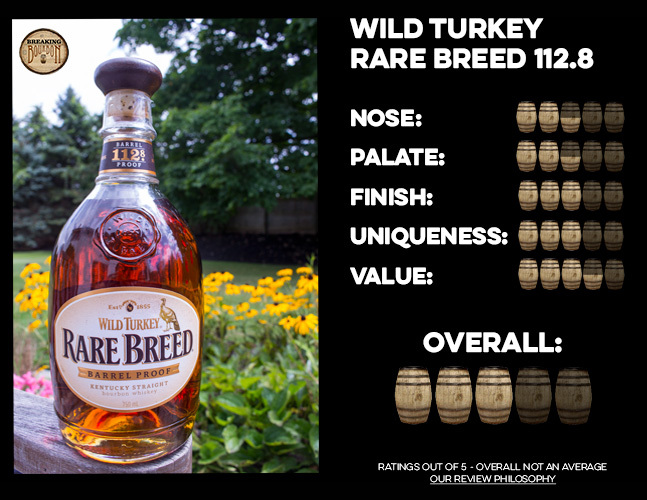 By comparison to other non-Wild Turkey bourbons on the market however, the 112.8 proof batch of Rare Breed shines a little brighter. It’s Wild Turkey flavor profile in true barrel proof form offering big spice upfront and a long, complex, and enjoyable finish. 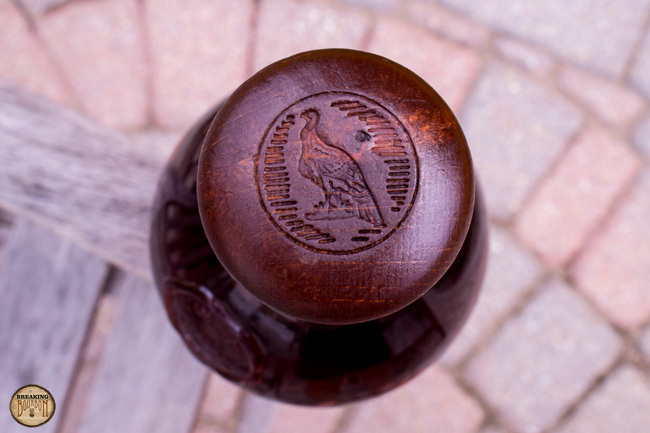 As Wild Turkey’s barrel entry proof ranges from 107 to 115, it results in a relatively low barrel proof, which could be considered a positive attribute when compared with non-barrel proof offerings of a similar proof that are diluted with the addition of water after being dumped. While a higher barrel entry proof may yield a more flavorful barrel proof bourbon, some would argue the higher barrel entry proof is actually a cost savings measure taken by distilleries to push up to the maximum allowable 125 barrel entry proof to be considered bourbon. This ultimately yields a higher barrel proof and allows for more water to be cut into their final non-barrel proof products in order to increase the overall production volume per barrel. Considering what Rare Breed can be as evidenced by Batch 1 along with some of the other excellent Wild Turkey bourbons, I’m all in for getting behind the concept of a lower barrel entry proof. 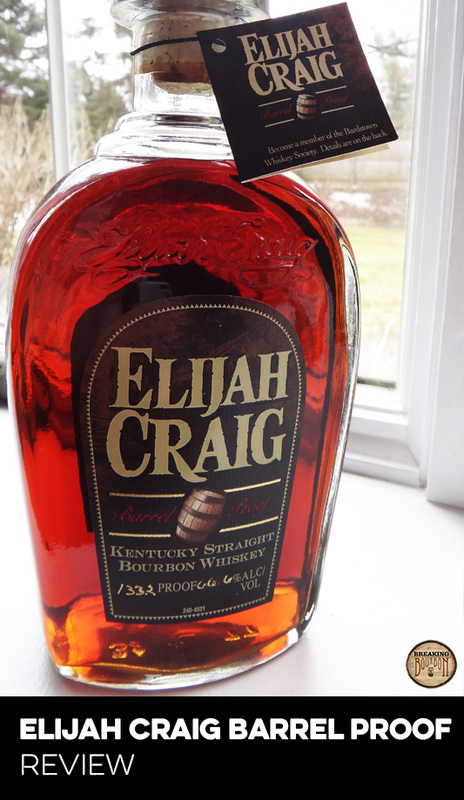 While I certainly enjoy the heavy hitters, not every barrel proof bourbon needs to be a mouth scorcher, after all. While this batch of Rare Breed is not my favorite product currently available from Wild Turkey and I even prefer their lower priced Wild Turkey 101 to it, it’s still a barrel proof blend of various aged bourbons for just a few dollars more than mid-$20 range budget bourbons. 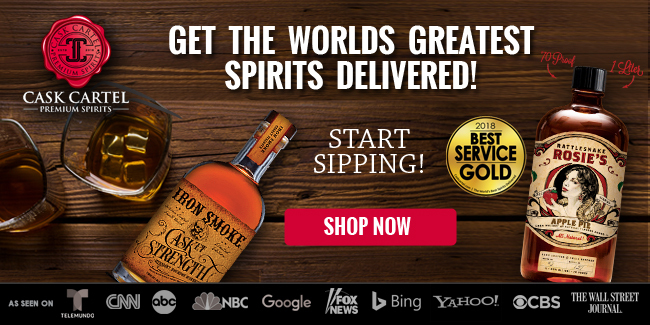 It’s the lowest cost barrel proof bourbon offered by a major Kentucky distillery and by that measure it could even be considered a bargain at $35. As evidenced by my own comparison with Batch 1 as well as other comparison reviews with different batches however, this particular batch does not necessarily represent the best Wild Turkey has offered and I would guess Wild Turkey has skewed more heavily toward the 6 year old component in the batch. 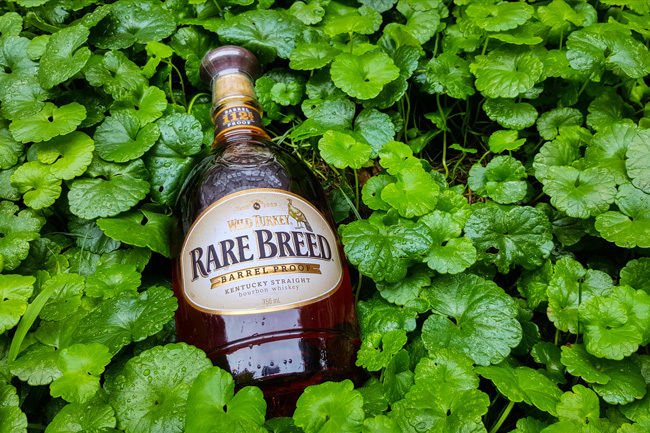 Regardless, Rare Breed is a staple that should be in every bourbon enthusiasts’ liquor cabinet. Now that I’ve spent more time getting to know it a little better, that includes my own. 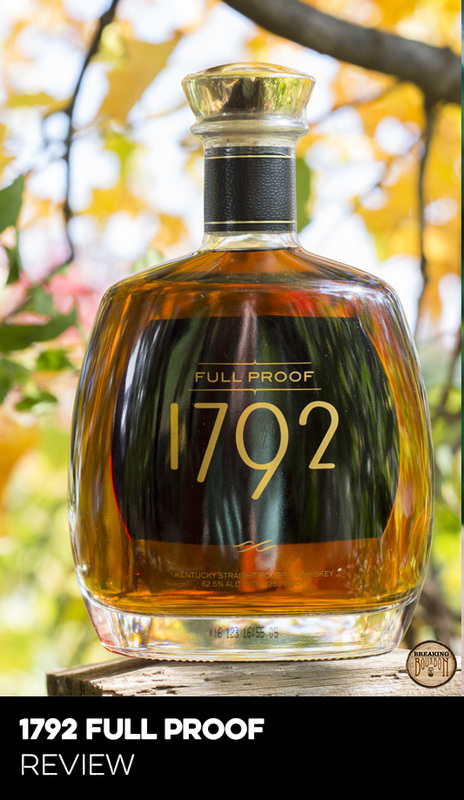 While not the best Rare Breed Wild Turkey has produced, the 112.8 proof batch offers big spice upfront with a complex and chewy finish for a fair price. It’s well known that Master Distiller Jimmy Russell prefers bourbon between 6 and 12 years old, once it’s had enough time to develop character, but before it becomes overly woody. 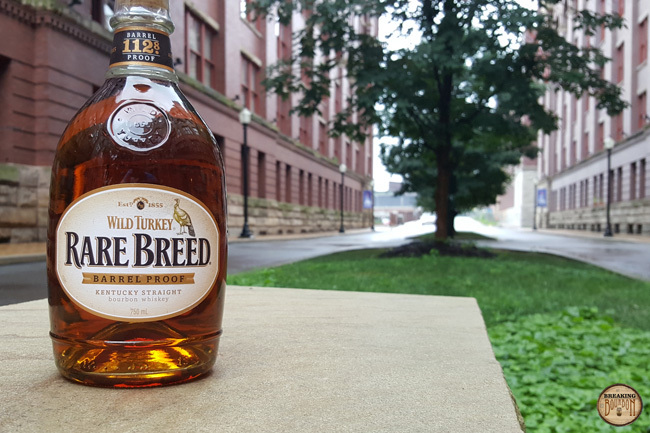 Being a blend of 6, 8, and 12 year old barrels and bottled at barrel proof, Rare Breed offers a means to experience Wild Turkey bourbon in true form as Jimmy might want you to. Each batch will have distinguishing characteristics, though a bold, spicy kick upfront with a relatively complex and chewy finish is to be expected. 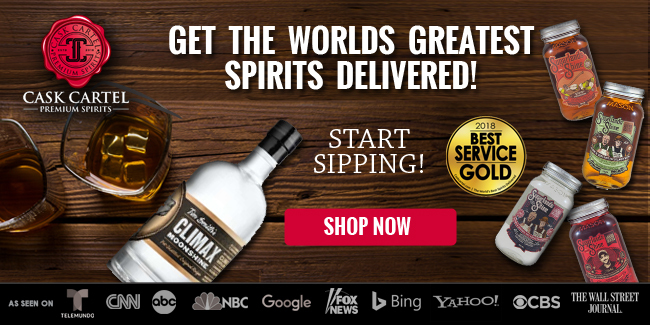 While the 112.8 proof batch is not my favorite readily available product currently offered by Wild Turkey, it’s reasonably priced and some will find more to like than I do. With that in mind, the additional time I spent with this batch has me more intently looking forward to the next one.